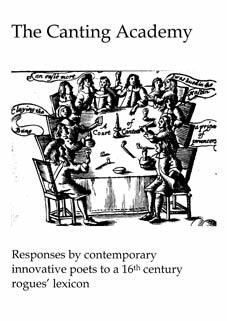 Responses by contemporary poets to Richard Head’s rogues’ lexicon 1673. Wrappers. Contributors include Vahni Capildeo, Kelvin Corcoran, Ian Davidson, Giles Goodland, Ken Edwards, Alan Halsey, Rupert Loydell, Christine Kennedy, David Kennedy, Geraldine Monk, Peter Riley, Gavin Selerie & Scott Thurston.